It seems that when getting to the Israeli Arab conflict there is always some fog around that makes the idea difficult to understand, it is almost as if every time you read something about protests against Israel you need to bend your mind to really dig at what is the actual issue at hand. Only a coulpe of weeks ago we published news about London’s UCL Muslim pressure story and now we have news about another famous and glorious English institution of higher education, the London School of Economics (better known as LSE). This is one of the great schools in the UK, Europe and the world, and you do need to have some intellectual stamina to be included in its ranks. This news is about a group of Arab-Palastinian demonstrators, setting up what is now already a known graphic protest, the presentation of the every day life of Palestinians under Israel occupation. This includes oversized guns and an ultra aggressive behavior that is intended on insulting and even physically attacking passers by to “show” how life really is in Palestinian areas. 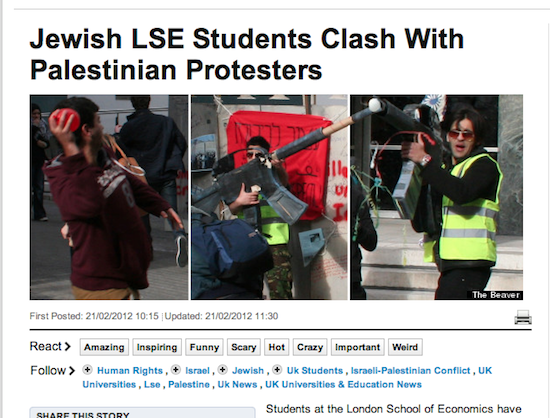 Jewish and Israeli students of LSE have seen that, and knowing first hand what life is really like had their own protest, this presentation is simply false and fake they claim, and as the argument went so did blows and water balloons and such things. This is yet another story how religion fights another religion, only this is an exceptional case, it does look like Muslims around the Western world have decided to influence public opinion, meaning they are targeting mainly Christians, to slander Israel. Why is this not political? well, because if the organizers of this protest would have been political activists they would probably worry more about the daily massacre of Syrians by their own government, just one example in an Arab world that is full of violence which is far – far worst than anything Israel is doing to some of the Palestinians living in Israel. Another point worth mentioning is that Palestinians have (relatively) vast areas of control and self governance, areas where no Israeli (civilian or soldier) had set foot in for years, it is not even 30% of Palestinians that are facing road blocks and Israeli soldiers on a daily basis. It is clear that these protests are being dictated from above, by someone who wants to keep an anti-Israeli agenda, while bluntly ignoring every political events in the area, the bloody, months old fight in Syria, the oppression of the same kind of protests in Jordan, the every day killings and murders of Christians in Egypt, and the political storm in Gaza, where a transition of power is soon to take place.